In this recipe, we learn to make vegan Swiss Meringue frosting that is scented with lavender essential oil. This icing beautifully tops our classic chocolate cupcakes made from the Cocolicious Cake Mix, and then filled with a simple chocolate ganache. Let’s get baking! Lavender is one of my favourite floral scents. It immediately reminds me of spring and new growth, so when I started experimenting with floral flavours in our treats, lavender was the first one to be used. In edible treats, it is simply DIVINE! Dolled Up Desserts is actually known for its Lavender Lemon Short Bread Cookies, which we won the 2017 Toronto Vegan Bake Off with. 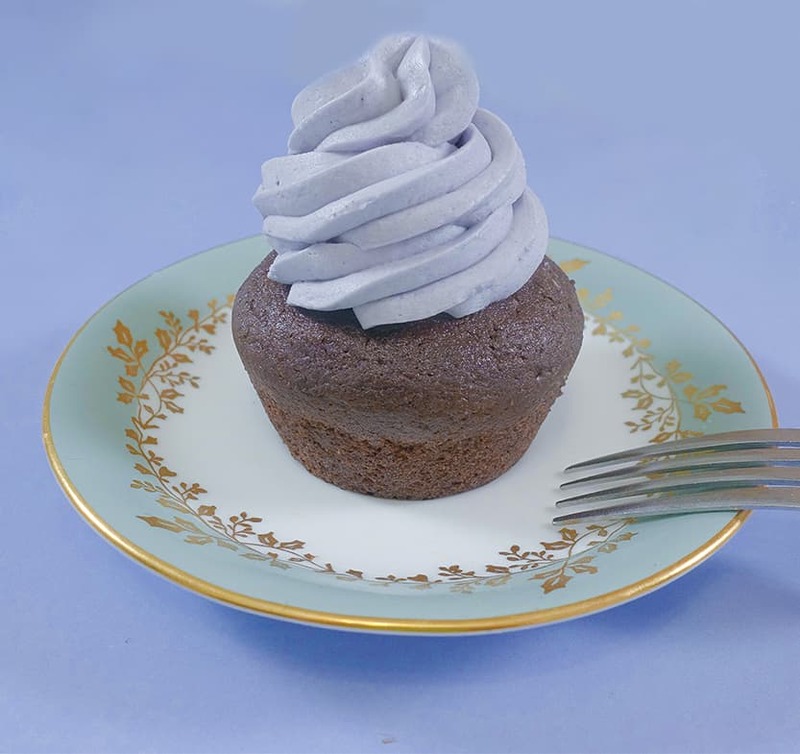 Lemon and lavender, or earl grey, or any delicate flavours, are typically paired well… but lavender paired unconventionally with chocolate cupcakes and a rich chocolate ganache, and you're in for a real unique treat. This recipe is really special because we are going to teach you how to make Swiss Meringue Buttercream. Swiss Meringue is typically made with egg whites, but well, this is eggless and vegan, so we have formulated a way to achieve that same stable lightness and versatility of a Swiss Meringue, sans cruelty. Our vegan swiss meringue buttercream does contain soy isolate protein, which at this time cannot be substituted from the icing or else the icing will not work. It is essential you follow this icing recipe to a tee, or else you could end up with disaster. If you make this amazingly light and fluffy eggless swiss meringue butter cream, be warned that it is not just a simple whip-and-pipe frosting. Follow the direction, use weights and exact measurements, and when in doubt, keep whipping it. It's worth the extra work. If you don’t feel like making this icing, check out our Carrot Cake 3 Ways blog post and follow our classic cream cheese frosting icing. It will give you delicious results! Another important disclaimer before we get into this recipe is that the lavender flavour comes from food/therapy grade essential oils. We understand and are aware essential oils are not for everyone and NOT ALL ESSENTIAL OILS CAN BE INGESTED. We only use minimal amounts of oils generally recognized as safe for internal use ( click to see full list of Generally Recognized as Internal Use (GRAS) by the FDA ). We only buy pure, food grade and carefully processed oils for our baking, so if you have questions about which brand we recommend, please send us a personal message. Essential oils are not FDA approved or regulated, and it is not in our interest or expertise to recommend oils for any health or wellness related uses. If you have any questions about the use of essential oils for baking or cooking specifically, you can send us a personal message or comment below. We are happy to inform you of how to extract lavender flavour from leaves at home through boiling and reducing water into the essence if you’d prefer this method, but we would not recommend making this icing if you choose to extract your own lavender flavour. We will prepare the icing first. In a bowl, dissolve the soy isolate protein powder, icing sugar, essential oil and gel icing colour into the non-dairy milk. Cream non-dairy butter on medium high speed for about 2 minutes. Once creamed, turn the speed down to low and gradually pour in the purple sugar-protein slurry. Speed up the mixer to medium high speed and mix for approximately 5-7 minutes. Your icing will go through 3 distinct phases. Cottage Cheese: your icing will look like it is not combining at all. Bits of butter will be broken up and covered in purple slurry, but will remain separated. Cheese Curds: your butter clumps start to come together into bigger pieces but it is still not coming together. Mayonnaise: your icing is complete when you get to this phase. The icing should be smooth, glossy, light to the touch, almost like whipped cream. Place your icing bowl into the fridge or freezer to set. We will rewhip it again later. Preheat oven to 350°F. Line a cupcake pan with cupcake liners or grease each cupcake well with coconut oil. Prepare your chocolate cupcakes as directed on the baking mix package. Portion batter into 12 cupcake liners and bake for 15-20 minutes. Let cupcakes cool completely. While the cupcakes are cooling, prepare the chocolate ganache. Heat up the non-dairy milk in the microwave or on the stove until warm. Add the chocolate chips and butter and let melt while stirring. Gradually add icing sugar to the ganache and stir until it is thickened. Pour ganache into piping bag if available otherwise have a spoon on hand. Remove cupcakes from pan and make a hole in each cupcake centre. You can either cut out a hole using a knife, or simply poke a hole that goes 2/3 of the way deep into each cupcake using your index finger. Fill each hole with ganache until it reaches the top. You can achieve this with a spoon or a piping bag. While your cupcakes are resting, let’s do one final rewhip to the icing. We rewhip the icing because it will separate as soon as it comes up to room temperature. Remove the icing from the fridge or freezer and warm it quickly by placing the bottom of the bowl under hot water (Do not get the icing wet). Stir the icing and break it up using a spatula. You will notice it will start to separate, almost like it is going back into the Cottage Cheese state. This is good. Rewhip your frosting for another 5 minutes on medium high speed. You will notice the icing goes through the exact same phases again, but this time it will remain as mayonnaise so long as you work quickly and don’t heat the icing up too much with your hands. If you do not have a piping bag and star piping tip available, ice cupcakes with the back of a spoon and enjoy. If you do have a piping bag and star piping tip available, fill piping bag with half of the icing and pipe icing as desired. To pipe the cupcake to give it a professional look, start at the centre of the cupcake with the bag at 90 degrees. Pipe icing slowly to form a middle base (enough to cover the ganache hole you made earlier) and wrap the icing around that middle base. 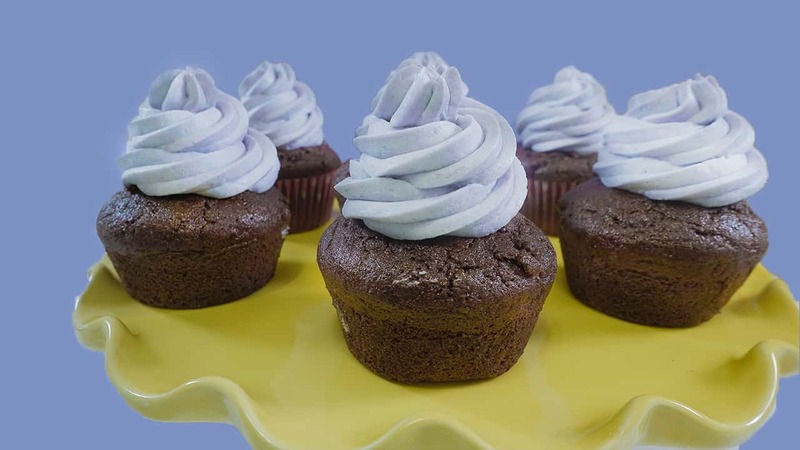 Continue a steady stream of frosting in a second layer and end it with a final swirl, ending again in the middle of the cupcake with piping tip and bag at 90 degrees to the cupcake. Simply stop squeezing the frosting to end the stream, and pull the bag straight upwards. Repeat for all cupcakes and refill piping bag as necessary. Cupcakes can be kept at room temperature for 12-24 hours. Please freeze cupcakes for up to 4 weeks for maximal moisture retention. Do not refrigerate! Your cupcakes will dry out within an hour or two.